Sanofi is a french global company focussed on the health sector. The organisation was funded in 1973 as a subsidiary of ELF Aquitaine Group. Some of its activity includes pharmacy and vaccines production, placing the company in 3rd place worldwide in terms of turnover. It’s also the first French company for research and development reaching more than 5 billions invested into this in 2016. Counting more than 100 000 collaborators representing 145 nationalities, a presence in more than 100 different countries and a deployment of their solution in more than 170 countries all over the world, Sanofi Group commits to improve everyone’s life everywhere in the world via sustainable and responsible solutions and innovations. With this commitment and as a health path partner, Sanofi must offer innovating solutions, that’s why the Group uses Dialogfeed. Being highly implied in research and development it’s important for Sanofi to be able to communicate theirs research results as well as the news related to the sector to their wide audience in order to highlight their investment. The Social Wall powered by Dialogfeed was chosen as the most innovative way to communicate those informations to their audience. By choosing our Enterprise plan, Sanofi got a complete offer including a widget option and API allowing full customization. 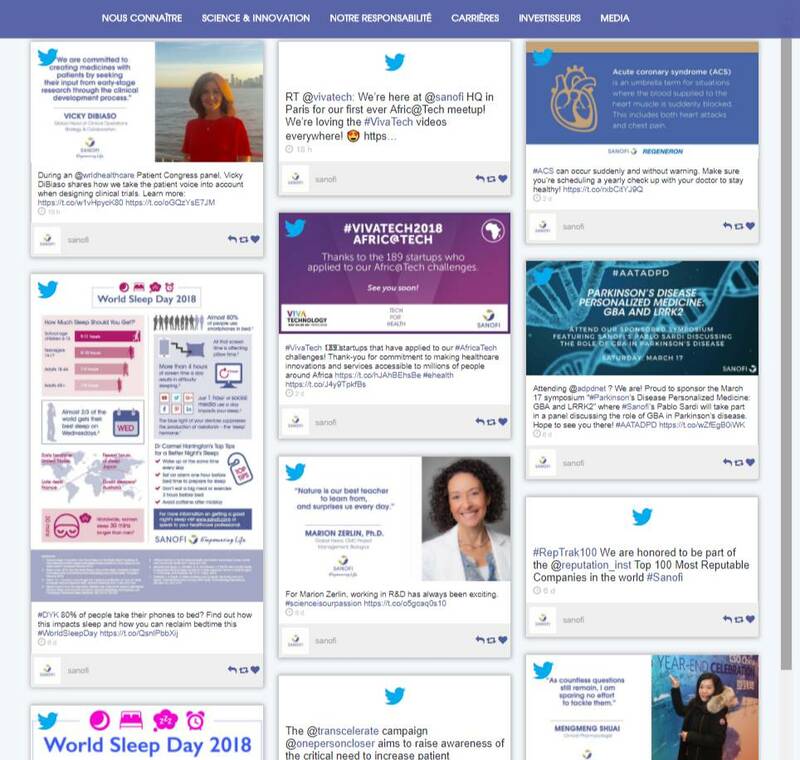 Sanofi enjoy now two different social walls on their website. One is placed on the homepage and displays live all the information related to the company shared on their social media accounts (Twitter, Facebook…) in order to keep informed their audience. The second one is place on their careers page and displays the posts from their LinkedIn account in which they show their core values (Integrity, respect, courage and teamwork) as well as communicate in a subtile manner about the brand global reach. Social wall to improve social media health communication, why ?